The 47th Annual Meeting of the American Association for Dental Research (AADR) is currently taking place in Fort Lauderdale, Florida, and has already turned out some interesting new findings. For example, one presentation indicates that certain types of bone damage can be healed using a form of 3D printing. 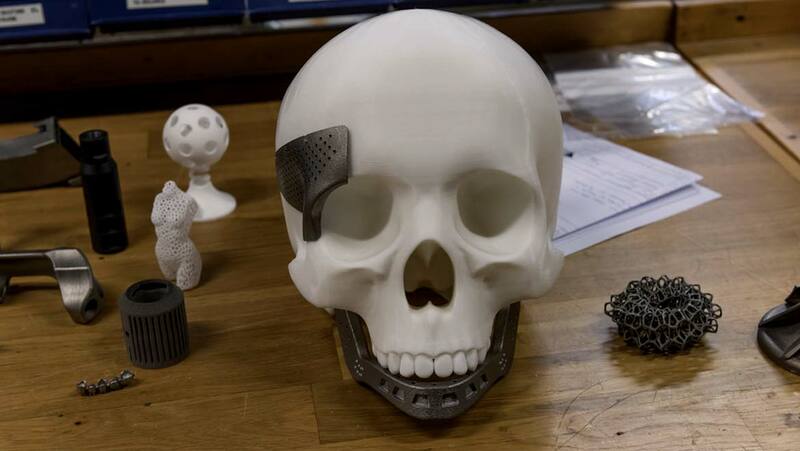 The project being showcased in this instance is intended to address skull bone defects, which are difficult to treat with conventional surgery. This new alternative therapy, however, involves the direct delivery of bio-compatible molecular scaffolds that are designed to enhance healing in damaged skull tissue. Injuries to the calavarium, or skull, are potentially serious events due to the possible danger to the brain implied. They are most often addressed through the application of a protective plate, which may be made of materials such as titanium, over the injury. However, this can impair healing in the tissues under and immediately around the plate. In addition, the plate may not fit properly in all cases, which may mean extra surgeries for the patient as their plate is replaced or re-sized. Therefore, treatment for skull injuries (typically termed ‘defects’) could benefit from some optimisation. Dr. Venu Varanasi from College of Nursing and Health Innovation at the University of Texas (Arlington) and the Texas A&M University (Dallas) College of Dentistry saw potential in 3D bio-printing that could be applied to his areas of medical research. It is an increasingly popular technique in the biotechnology space, as it can reproduce the basic requirements for tissue formation accurately and quickly. 3D printing is a process of building up solid objects with height, width and depth using long filaments of polymers or plastics often termed ‘inks’. People with the proper equipment can build models, tools and many other objects from the bottom up using one or more of these inks, in accordance with a computerised interface that mandates the 3D structure of said object. In the case of biotechnology, 3D printing has been optimised for the cellular or sub-cellular levels of accuracy needed in its products. This may involve an increase in resolution at which ‘bio-inks’ are laid down, which evokes the structures necessary at the microscopic (or sometimes even nanoscopic) levels. An example of these techniques that has proved successful in the past is jet-writing, a highly-detailed form of 3D printing that results in objects that mimic the natural micro-structure of bone. The researchers who developed jet-writing, and the bone micro-structures printed using it, claimed that their ‘print-outs’ could be successfully integrated into damaged bone to enhance healing in experimental animals. The same type of ‘print-outs’ were also used to model the mechanisms by which cancer spreads to bone tissue. This was done by introducing tumour cells into ‘bone tissue’ polymer analogues and seeing if they would form tumours in them. The researchers behind this innovation also plan to use the same strategy to predict the response to various drugs in the same tumours. However, bio-mimicking 3D prints need to match their natural counterparts in more ways besides structure. The ‘inks’ used in 3D bio-printing are bio-compatible polymers that may be inspired by natural tissue components found in the body. Therefore, they may be less likely to be ‘rejected’ by the host’s immune and cellular regeneration processes. The ink used in Dr. Varanasi’s project was based on biosilica for its neutral properties. This material was combined with sucrose and methacrylated gelatin. This gave a sufficiently viscous, yet flowing, ink. The cross-linking agent IRGACURE 2529 was also added to complete the ink. It was used to print out scaffolds, which are 3D structures in a precise conformation designed to encourage the growth of new bone. Scaffolds are a necessary component of regenerative medicine, as they ‘guide’ cells into appropriate locations to promote new tissue growth. Without them, it’s likely that the same cells may just form amorphous clumps rather than confluent layers of tissue. Varanasi’s scaffolds also closed up the bone in need of replacement in cases of skull fracture. These claims were based on animal and cell culture models of skull defects, in which the scaffolds in question were printed so as to match experimental defects. The defects coated in printed scaffolds exhibited approximately 55% coverage with new bone, whereas control defects only experienced 10% of the same. However, it should be noted that this figure was associated with only one of numerous ink formulations tested in the course of this project. However, histology performed on the bone defects showed that the scaffolds successfully promoted the migration of new cells from defect edges into areas lacking bone. This study may have shown that a regenerative medicine-based approach may be an acceptable alternative to plate-based surgery for patients who have lost bone mass in their skulls. This finding may be encouraging as tissues around a plate may never heal properly. Even though this is a preliminary report from a conference, it is a fascinating step forward in osteogenic regeneration. Jordahl JH, Solorio L, Sun H, Ramcharan S, Teeple CB, Haley HR, et al. 3D Jet Writing: Functional Microtissues Based on Tessellated Scaffold Architectures. Advanced materials (Deerfield Beach, Fla). 2018.